Not interested in or able to use Libby? For help listening to audiobooks with the original OverDrive app, see the instructions below. You can use the OverDrive app to listen to borrowed audiobooks on your Android device or Fire tablet. 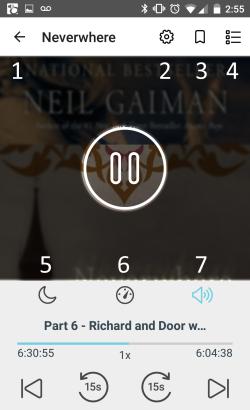 Note: If you'd rather listen to audiobooks in your mobile browser, you may be able to use OverDrive Listen instead. Once you've borrowed and downloaded an audiobook in the app, go to your app Bookshelf, then tap the audiobook to start listening.